At this step, define the flow property values for the geological formations. •If you wish to use a spatially-distributed property values, you have imported or created surfaces. •If you wish to subdivide zones into lateral regions, you have imported polygon shapefile(s) or digitized polygons. At this step, you define Property Zones for the conceptual model. Each property zone is assigned appropriate property attributes, e.g., conductivity, storage, and initial heads. 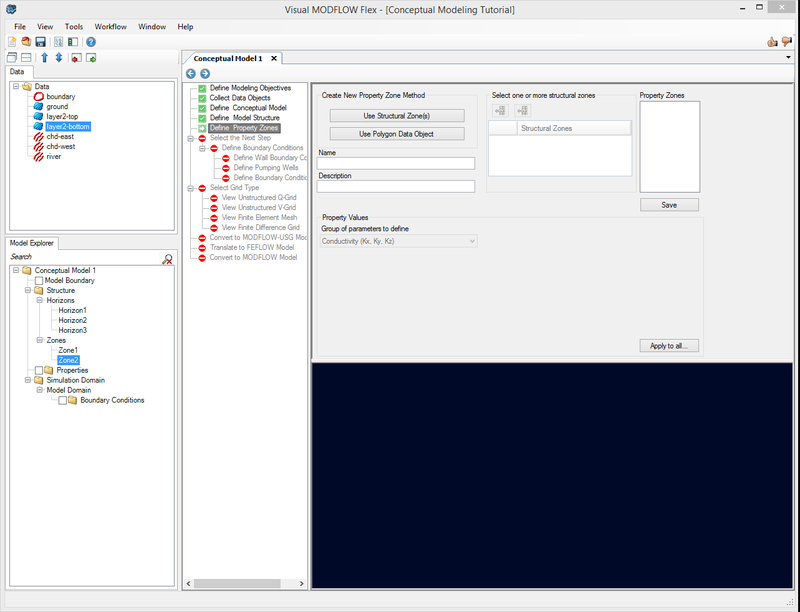 By default, Visual MODFLOW Flex automatically assigns the default property parameter values, specified in the Project Settings (see "Project Settings" for more details) to the entire model domain. However, in most situations, the flow properties will not be uniform throughout the entire model domain, and it will be necessary to assign different property values to different areas of the conceptual model. This can be accomplished by creating Property Zones. In Visual MODFLOW Flex, a property zone is a specified 3D-volume, generated from structural zones, with user-defined hydrogeologic attributes. Property zone geometry can be defined using one or more existing structural zones. As such, property zones can only be generated after horizons have been defined in the conceptual model. Please see Defining the Structure for more details. Make sure you have imported or created all the data objects that you plan on using for properties. If you wish to use a property distribution, Import Surfaces or Create Surfaces. Before you can create a property zone, you must have already defined horizons for the conceptual model. For more information, see Defining the Structure. •Enter a Name and Description (optional) for the property zone in the Name and Description fields, respectively. •Select the method by which the property zone geometry will be defined. There are two options: Use Structural Zone(s) and Use Polygon Data Object. •Click on the [Use Structural Zone] button as shown above. •Select a zone from the Model Explorer tree (under the Zones node), and then click the button to insert the zone in the Structural Zones field. •Click the Add button to add and combine structural zones. •Apply to all... button allows you to apply property attribute values for all polygons at once. 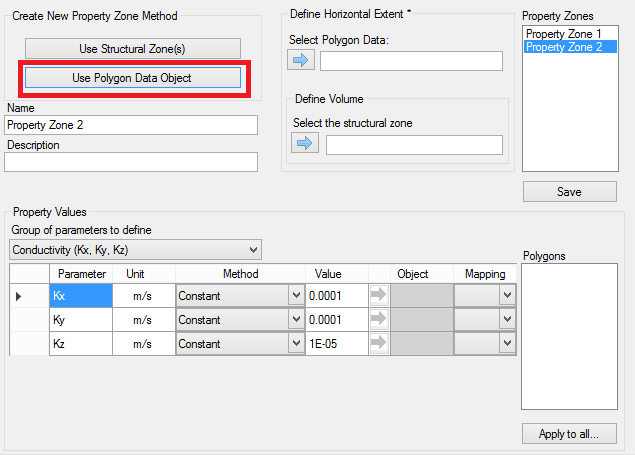 This method allows you to define a property zone using both a structural zone and a polygon data object. The polygon data object is used to define the horizontal extent of the property zone and therefore must be fully contained within the conceptual model boundary. The structural zone is used to define the volume, i.e., the vertical extent of the property zone. •Select a polygon data object from the Data Explorer, and click the button to insert the data object in the Select Polygon Data field. Please Note: The selected polygon cannot contain multiple parts, overlapping shapes or holes. These features are currently not supported for property zone creation. If your polygon does not meet this criteria, it can be edited using the 2D Viewer editing tools. For more information on this topic, please see "Creating New Data Objects"
•Next, select a structural zone from the Model Explorer tree, and click the button to insert the data object in the Define Volume frame. 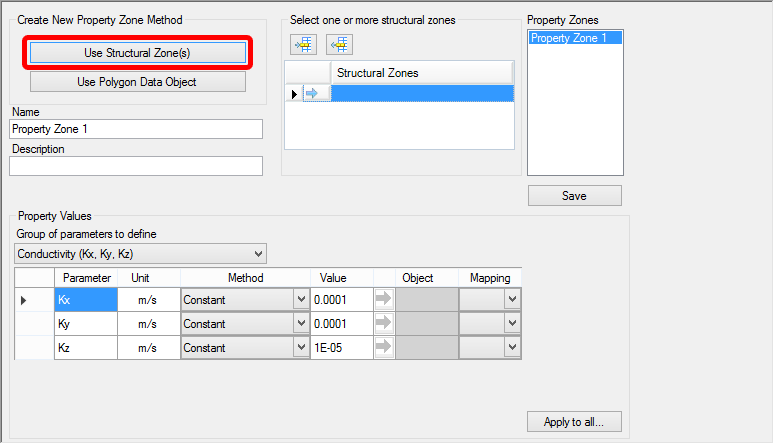 Once the geometry has been defined, you can assign parameter values to the property zone. •Select the group of parameters that will be defined, e.g., conductivity, storage or initial heads. The data input grid below will display the appropriate parameters based on which parameter group is selected. For example, if conductivity is selected, the data input grid will show the parameters Kx, Ky, and Kz. The data input grid will already be populated with the default values specified in the Project Settings (File > Project Settings... ). •Visual MODFLOW Flex provides various methods for assigning parameter attributes. The available methods include: Constant Value, Use Surface, Use 3D Gridded Data and Use Shapefile (available only when property zone is defined using polygon data object). The type of method used can be specified per parameter. For each parameter in the data input grid there is a combo box in the Method row (shown below). Each method is described in the following sections. The Constant Value method is selected by default for each parameter in the data input grid and allows you to specify a spatially constant value for the parameter. If you do not wish to use the default value, enter a new value. Please Note: The selected surface data object must cover the entire area of the property zone, or else the data object cannot be used. •Select "3D Grid" as the method from the combo box. You should then see the button become activated. •Click the button to insert it into the parameter field. •Select the desired attribute value from the "Mapping" combo box. •If you have not already done so, create the Property Zone Using Polygon Data Object, as described above. •Select the Use Shapefile Attribute from the method combo box. •Under Attribute column, the combo box contains all the attributes of the specified polygon. •Select the desired attribute from the combo box. Once the property zone attributes have been defined, click the [Save] button to create the property zone. 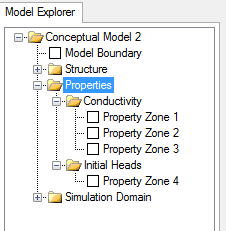 Once created, the property zone is added to the Model Explorer tree under the Properties node and under the appropriate parameter category node. If you need to include contaminant transport in your model, then the properties for transport will be done in the numerical workflow. Be sure that in the Define Modeling objectives step (in the Conceptual Model), that you have selected "Transport Active". After you define a numerical grid, and create a numerical model, the transport properties will be defined at the "Define Properties" step.